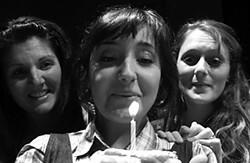 The MaGrath sisters celebrate Lenny’s birthday in Ferndale Rep's production of Crimes of the Heart. Nancy O’Bryan as Meg, Alexandra Gellner as Lenny, Katie Sutter as Babe. Playwrights Beth Henley and Marsha Norman made waves with their Pulitzer Prize-winning plays in the early 1980s. They were something new on the American theatre scene: Southern women playwrights, who both got their start at the Actor's Theatre in Louisville, and not in the Northeast. Their big plays (Norman's ’night, Mother, Henley's Crimes of the Heart) were classified as Southern Gothic, dealing with violence involving women as perpetrators as well as victims. Both were turned into good Hollywood movies, with especially fine roles for women. Both plays were notable then for their shock value, and so the first question I had when I saw Crimes of the Heart at Ferndale Repertory Theatre was whether it still had that particular kind of power. For me the answer was: not really. A quarter century of sitcoms later, the daringly sympathetic woman who shot her abusive husband is pretty tame, as is the promiscuous sister. But that only makes Crimes of the Heart an easier fit for community theatre audiences, which is otherwise fitting, since it was the participation of Beth Henley's mother in community theatre in Jackson, Miss. that got the future playwright and screenwriter into show business. It's still a decent play, based very loosely on Chekhov's Three Sisters, with some especially affecting scenes. The first act is creaky with exposition, but it gathers itself after that. 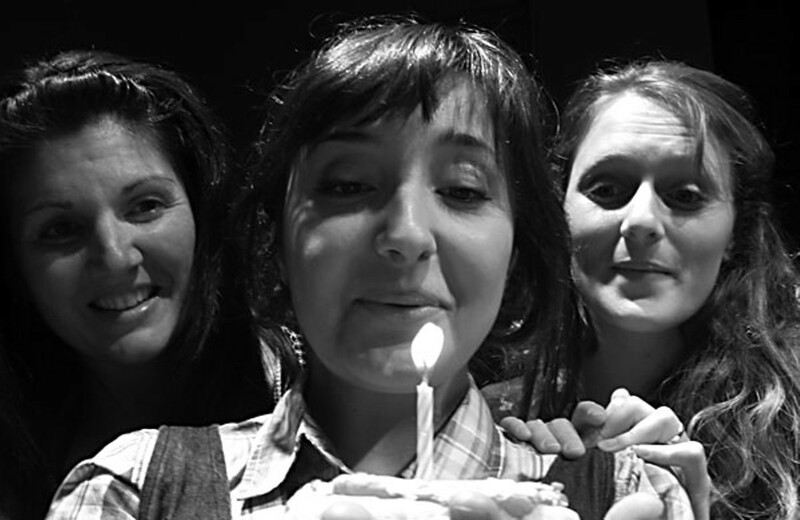 At Ferndale, Alexandra Gellner plays Lenny, the oldest of the sisters, the shy one, dolefully celebrating her 30th birthday, which almost no one else remembered. Katie Sutter is Babe, the youngest sister, who shot her husband, a powerful politician. Nancy O'Bryan is Meg, the beautiful one, who returns from Hollywood where her singing career dead-ended into a job in a dog food factory (a job Beth Henley once had). Babe's lawyer, who becomes more, is played by Neal Schoonmaker. Doc Porter, Meg's former and perhaps re-lit flame, was played by Victor Howard when I saw this, though Brian Walker is listed in the program. Gloria Montgomery plays -- and perhaps overplays -- Chick Boyle, a busybody relative. Director Ginger Gene kept everything moving, and focused the key scenes. All the actors got their characters across and told the story, to the general satisfaction of the audience. Alexandra Gellner had the toughest role as Lenny, and she made the most of some subtle shades. Katie Sutter was most impressive in the key role of Babe, as she stumbled from sweet denial to hard realization to vulnerable hope. And the birthday cake ending always works. But for all the words and movement, and all the events (mostly offstage), the play felt a bit distant, like a sitcom. I missed feeling the intimacy of sisters. It seemed they hardly ever touched. The action stays in the antique-laden kitchen (designed by Paula Long and Ginger Gene) -- partly for dramatic unity, and partly because Henley intended to produce the play herself, on a shoestring budget. But a friend sent it to the Actor's Theatre playwriting contest, and the rest is history. For the Ferndale production, Carolyn Jones and Vikki Young designed costumes, Katie Pratt designed lighting, and Ian Schatz sound. Crimes of the Heart plays at Ferndale Rep one more weekend, Friday and Saturday, Oct. 23 and 24, at 8 p.m., concluding with a matinee on Sunday, Oct. 25, at 2. Flush from the overflow success of its first "Speakeasy" Benefit, the Arcata Playhouse has scheduled another, on Friday, Oct. 23, with music etc. by Jackie Dandeneau and others. Details at www.arcataplayhouse.org. The HSU production of the musical comedy City of Angels opens Thursday, Oct. 22, at the Van Duzer Theatre and runs for two weekends with a final performance, a 2 p.m. matinee on Sunday, Nov. 1. Cy Coleman composed the music, and Larry Gelbart wrote the script. Since I work part-time for both the HSU departments producing the show (Music as well as Theatre, Film & Dance), I can't say much more here. But Larry Gelbart died just about a month ago, and I'll probably never get a better opportunity to pass on one of his jokes, one that few people have heard. Gelbart was a comedy writer for TV pioneer Sid Caesar, the main writer for the TV version of *MASH, and co-authored the stage comedy, A Funny Thing Happened on the Way to the Forum, seen at Ferndale Rep in 2006. Gelbart and his wife, Pat, were friends with Steve Allen and his wife, Jane Meadows. In addition to hosting and inventing The Tonight Show and other comedy shows, Steve Allen wrote a series of mystery novels, and in one of them, there's a scene with Larry and Pat Gelbart as characters. I spent a week hanging out with Steve Allen in the early ’90s, shortly after this novel came out, and he told me what happened next. Allen sent Gelbart a note, telling him about this scene. Gelbart wrote back to thank him, and added, "This goes a long way to making up for Pat and I being edited out of War and Peace."